Recently I reviewed a book called Twelve Ordinary Men. In that review, I mentioned that the chapter that was the most memorable to me was the one about Judas. That probably sounds weird. After all, there were very detailed and vibrant chapters about the more famous disciples, Peter, John and Andrew. The others were all covered as well, but since there is less biblical and historical detail on them, there was less to discuss. But still, the one that sticks with me the most is Judas. Probably because I relate to it so well. Stick with me, here. Because as interesting as it may be to read about my health, book reviews or psychotic self-defense instincts, this is really what my life boils down to. I don't have cutesy graphics or fancy font effects for this post. Just my story and my plea for you to read it. 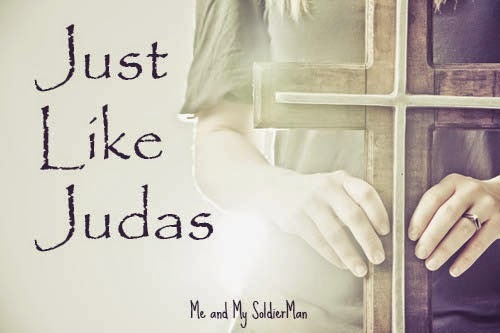 Judas, from what can be gleaned from Scripture, was by all accounts a respectable person. After all, he was the one who handled the money for the group. He must have been (outwardly) trustworthy. And he blended into the Twelve seamlessly for 3 years. Even when Jesus practically pointed him out as the Betrayer at the Last Supper, none of the others suspected him. He was that good. And yet, even after living with Jesus for 3 years, seeing the miracles, experiencing the love and hearing the teachings - Judas still betrayed Jesus for 30 pieces of silver, which wasn't exactly a lot of money; it was just the most he could bargain with the Pharisees for Jesus' life. Now, yes, there are a lot of providential and prophetical circumstances surrounding Judas. You'll have to read the book to get a good, detailed list of all the Old Testament Messianic prophecies Judas fulfilled in the means and manner by which he betrayed Jesus. However, and I'm Calvinist-ish, it doesn't take away the fact that this was still Judas' choice. The point is this: if even someone who lived and walked and talked with Jesus in the flesh could come away unchanged, not Born-Again (the term Jesus used to describe salvation), then those of us who live 2,000 after Jesus left the Earth can as well. I know, because that was me. I grew up in church. My dad is a pastor (now a lay-preacher, not a formal head of a church but he is on the preaching rotation at his church). We were at the church every time the doors were open. I taught a Sunday School class. I brought friends to church. I knew all the right answers. It didn't matter, not really. It was just ritual, motions, me following in my family's faith but not my own. One day before we got married, I was at a college ministry event at our church. And there was some great worship going on, and for some reason I couldn't understand, I just kept hitting a wall spiritually. Something wasn't clicking, I wasn't able to really engage and feel the presence of God like I longed for. It wasn't just a lack of an emotional experience. I'd done that before, it's pretty easy to conjure up for yourself, really. But I could feel a wall between me and God. And I started praying, and asking God if there was any unconfessed sin in my life separating me from Him (which, by the way, is an excellent exercise. If you are trying to seek God, ask Him to show you how. He will.). And as though I heard an audible voice, I was struck with the realization, "You aren't really my child." And the enormity and reality of it was undeniable. And overwhelming. And real, the most real thing I've ever known. See, it's very popular to say, "We're all God's children," and that sounds really nice, but it's not true. We're all God's special creations, made in His image. But no one is born His child. Only once you have been adopted by Him (Eph. 1:5; Gal 4:5; Rom 8:15) are you His child. And so, that's what I did. I confessed my sinfulness before God, my inadequacy and my imperfections, and committed my life to Jesus, promising to do whatever He told me to do (which is a daily struggle, since He's always trying to push me out of my comfort zone and grow me to make me more and more like Him every day). And that's what makes me different from Judas. I've been adopted, redeemed, born-again. And it changes everything. Life doesn't stop, and stuff still happens. Circumstances don't magically become perfect. I don't magically become perfect. Except in the eyes of God. That's the only way to find true perfection and freedom. And peace. "The fruit of the Spirit is love, joy, peace, patience, kindness, goodness, faith, gentleness, self-control." (Gal 5:22-23) Some of those I am still working on, but all of them I experience in one way or another from God. Because even in the midst of some really unsettling and frustrating situations, I know He is always there to give me peace and comfort and forgiveness, enabling me to forgive myself. Even, and especially, when I don't deserve it. Take it to heart: Turn to God. You can trust Him. He will prove Himself faithful again and again. Right now, just pray and ask God to reveal whatever may be keeping you from that intimate relationship with him - pride? shame? religious training? fear? prejudice? There can be a million reasons. Not one of them worth it. Because - and I know this isn't popular to say and I don't enjoy bringing it up, but it's the truth - ultimately, there's a lot more at stake than just peace of mind (although I totally know how precious and elusive that is). Because there is a very real physical place called Heaven, and there is a very real physical place called Hell. And we will all live forever in one of those two places. God's children will get to spend forever in Heaven, with their family and friends who are also God's children, enjoying the New Earth we're told about in the Bible, exploring God's creation in ways we only dream of now, living a life more full and exciting and REAL than we can possibly imagine (this is a concept I am learning about in a new way, and I look forward to sharing about with you in the near future). But those who are not God's children won't. They will go to a place of eternal suffering. Does that sound harsh? It did to me, before. Before I realized how much I really deserve to go there myself. Even now, sometimes I forget how vindictive and petty and prejudiced and hateful and jealous and greedy and selfish I can be, how I can lie to people's faces for the sake of some minor self-preservation, how I can take without giving. For all these things, and more, I deserve Hell. Forever. Please, I know this is long and probably redundant at points, but please. If there is any twinge in your heart right now, don't hesitate. Take it before God, grab a copy of His Word and ask Him to reveal His truth to you, the truth about who He is and who you are and how much He loves you. I can promise you won't regret it. Love, love, *love* this post!! A lot of the things you said about being a pastor's kid resonated with me about current family situations. Since you grew up in it, you knew all the right answers... You had the head knowledge, but not the heart knowledge. What a great start to my morning. Thank you! It's funny that you wrote this because JUST last night I was reading with my husband from our daily devotional book and the scripture that was being referenced was that of Epgh. 1:5,13. You and I have so much in common...PK, Reformed, etc., but more than that coming to terms, at some point, that faith has to be a personal thing and not just a familial or cultural thing. It's still a struggle for me, sometimes, not to just go through the motions, but I think God is glorified even by our battles to do His Will despite not "feeling" anything when we do it. I am your newest follower. I hope you will follow me back. I just wanted to say I love this post..
Wow, what an amazing and inspiring post! You are an incredible woman.